In order to develop information about the meteorological conditions on Magdalena Ridge we are collecting data from three locations on the ridge. These locations are at the 2.4-Meter Telescope site, the Interferometer site and Microphone Hill. 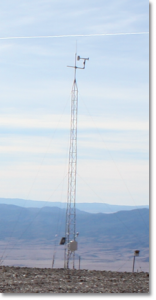 The first two sites are operated by MRO and the third site, Microphone Hill, is operated by Dr. Carl Popp as part of the Langmuir Laboratory Meteorological Station, Air Quality Group, New Mexico Tech Geophysical Research Center. Each station records air temperature, relative humidity, barometric pressure, rainfall and wind speed and direction. Wind chill and dew point are calculated using these measurements. As of August 2005 only the 2.4-Meter Telescope station provides near real-time information on these web pages. The 2.4-Meter Telescope system consists of a Campbell Scientific weather station which includes sensors for air temperature, relative humidity, barometric pressure, rainfall and wind speed and direction. The data is recorded on their CR10X data logger once per minute. The data is archived on a daily basis on the MRO server. And the last 6 minutes of data are displayed on the MRO web pages. This station has been in operation since mid-December of 2002. The Interferometer system is a Davis Instruments station which includes sensors for air temperature, relative humidity, barometric pressure, rainfall and wind speed and direction. The data is recorded to a local computer 15 to 40 times per minute and transferred to the MRO server for archiving. The data is plotted on both a daily and monthly basis with one minute averages. The Microphone Hill system is also a Davis Instruments station which includes sensors for air temperature, relative humidity, barometric pressure, rainfall and wind speed and direction. The data is recorded to a local computer at a much lower of rate, (once per 30 or 60 minutes). The data is archived on the MRO server on a monthly basis.